This website is about the terrible disease called ME/CFS and its many symptoms. ME, as its known in the UK and other parts of the world, and the Chronic Fatigue Syndrome as its known in North America, is a very complicated condition with no cure. Doctors in the UK mainly accept ME as a debilitating illness, although still some are skeptical. 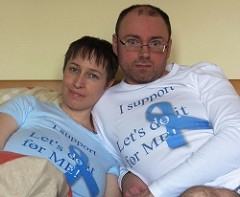 This website is for everyone and we have had great support from the ME/CFS community. Also many have found it beneficial if they haven't had a diagnosis and come across the web site and recognised their symptoms. About us personally, we are Nigel and Miranda, a married couple and both are sufferers, Miranda is currently bed ridden, both of us have been at some point in our illness. ME/CFS is a crippling neurological condition generally following a viral infection, although not in every case, in previously healthy and robust people. Some refer to it as Post Viral Syndrome. It can last for many years and in some cases render the sufferer bed-bound. ME affects all the body and brain, so there is are many areas of medicine involved, including Sleep experts, Immunologists, Virologists, Neurologists and others. Although some Dr's still won't accept the illness as anything but pyschological, there are so many studies to disprove this. The illness indeed is very much an organic disease of many symptoms. Despite setbacks there are a lot of positives going on in the ME world, we will address some of the more interesting one's, regarding this. There are other conditions that some Dr's believe to be the same thing as ME, or related to ME. It is widely accepted that Fibromyalgia (FMS), is a similar condition and many Dr's believe it could be one of the same. Thyroid problems and Gilbert's Syndrome are often accompanied with ME. We have done this as we feel it's important to make people aware that this condition, may in fact have more symptoms in many, not all, people with it. There are lots of people who have being diagnosed with ME and have GS, that we feel there must be something going on. If you are one of these people, why don't you vote on the poll.